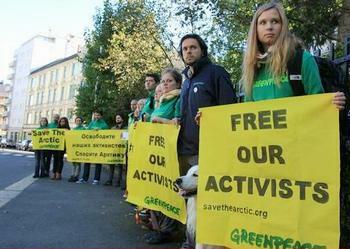 AMSTERDAM, The Netherlands, October 4, 2013 (ENS) – Russian prosecutors have charged 30 people with piracy – 28 Greenpeace activists and two journalists – following what Greenpeace describes as “a peaceful protest” against oil drilling in the Russian Arctic. They are being held in a prison in Murmansk. If convicted, the defendants could be imprisoned for a maximum of 15 years. The 28 activists were involved in a protest against the Gazprom Arctic drilling platform Prirazlomnaya on September 18 in the Pechora Sea off Russia’s northern coast. Five of the activists tried to climb the side of the platform and hang a banner. Gazprom intends to be the first company to pump oil from Arctic waters, which Greenpeace warns would hasten climate change while the Arctic is already melting. The Greenpeace ship in which they traveled to the site of the protest, the Arctic Sunrise, was seized by Russian authorities on September 19. American Peter Willcox (Captain, Arctic Sunrise); Swedish / American dual citizen Dima Litvinov; Argentinians Camila Speziale and Miguel Hernan Perez Orzi; Australian Colin Russell; Brazilian Ana Paula Maciel; Britons Frank Hewetson, Iain Rogers, Philip Ball, Alexandra Harris, Anthony Perrett, and freelance videographer Kieron Bryan; Canadians Alexandre Paul and Paul D. Ruzycki; Danish citizen Anne Mie Roer Jensen; Dutch citizens Faiza Oulahsen and Mannes Ubels; Finnish citizen Sini Saarela; French citizen Francesco Pisanu; Italian Cristian D’Alessandro; New Zealanders Jonathan Beauchamp and David Haussmann; Polish citizen Tomasz Dziemianczuk; Ukrainian citizen Ruslan Yakushev; Russians Andrey Allakhverdov and Roman Dolgov, Russian freelance photojournalist Denis Sinyakov and one other Russian crew member whose name is withheld upon his/her request; Swiss Marco Weber; and Turkish citizen Gizhem Akhan. 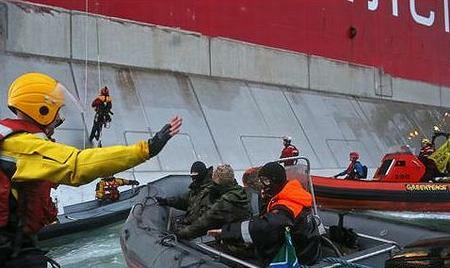 Greenpeace activist, left, puts his hands up as Russian Coast Guard officers, center masked, disrupt the protest action. 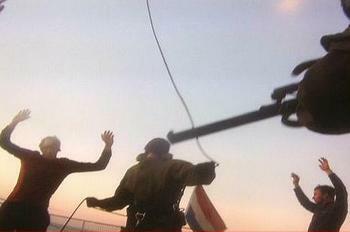 Another Greenpeacer hangs from a rope thrown up on the Gazprom drilling rig, September 18, 2013. (Photo courtesy Greenpeace). The Dutch government today announced that it would initiate arbitration proceedings against Russia under the UN Convention of the Law of the Sea to secure the release of all 30 people charged. They have been refused bail. Article 287 of the UN Convention of the Law of the Sea provides States Parties with a “menu” of different options to settle disputes, including the International Tribunal for the Law of the Sea, the International Court of Justice, an arbitral tribunal or a so-called “special arbitral tribunal.” Russia ratified the convention on March 12, 1997 and issued a declaration opting for settlement of disputes through special arbitration. “There can be no doubt about why the charge of piracy has been brought and the legal hammer wielded. An effort is underway to intimidate us, but our peaceful passionate campaign against Gazprom and all other Arctic drillers will not be silenced,” said Naidoo. She describes the experience of sitting through hearings in a cage and living in a prison cell that is “ice cold” and where the lights are never turned off. Mikhail Fedotov, the head of the Russian presidential Human Rights Council, said Thursday that he sees no reason to prosecute the crew of the Arctic Sunrise for piracy. The council is an advisory panel established to assist President Putin in fulfilling his constitutional responsibilities to guarantee and protect human rights. Groups such as Amnesty International, Human Rights Watch and Reporters Without Borders have called for the release of the activists. On Saturday October 5, rights groups critical of the charges plan to hold protests around the world in an emergency global day of solidarity. In Hong Kong hundreds will gather at the main harbor to form a human banner. In South Africa people will come together at former Apartheid detention centres. In Canada large audio and visual displays will light up at an all-night event. In Madrid supporters will gather in Puerto del Sol with a replica of the Arctic Sunrise ship. And in Senegal fishermen who last year welcomed the Arctic Sunrise on its voyage to preserve their fishing grounds will take to their boats again in an act of solidarity. Captain of the Arctic Sunrise, Peter Willcox is a U.S. citizen, and resident of Connecticut. Willcox was also the captain of the Greenpeace ship Rainbow Warrior when it was bombed by the French Government in Auckland, New Zealand in 1985.